Antiquity of Pisciculture - Italian Fish-Culture - Sergius Orata - Re-discovery of the Art - Shaw versus Gehin and Remy - Jacobi - Shaw of Drumlanrig - The Ettrick Shepherd - Scientific and Commercial Pisciculture - A Trip to Huningue - Bale and its Fish-market - Huningue described -The Water Supply - Modus Operandi at Huningue - Packing Fish-Eggs - An important Question -Artificial Spawning - Danube Salmon - Plan of a Suite of Ponds - M. de Galbert's Establishment -Practical Nature of Pisciculture -Turtle-Culture - Best Kinds of Fish to rear - Pisciculture in Germany - Stormontfield Salmon - Breeding Ponds - Design for a Suite of Salmon-Ponds -Statistics of Stormontfield - Acclimatisation of Fish - The Australian Experiment. THE art of fish-culture is almost as old as civilisation itself. We read of its having been practised in the empire of China for many centuries, and we also know that it was much thought of in the palmy days of ancient Italy, when expensively-fed fish of all kinds were a necessity of the wonderful banquets given by wealthy Romans and Neapolitans. There is still in China a large trade in fish-eggs, and boats may be seen containing men who gather the spawn in various rivers, and then carry it into the interior of the country for sale, where the young fish are reared in great flocks or shoals in the rice-fields. One Chinese mode of collecting fish-spawn is to map out a river into compartments by means of mats and hurdles, leaving only a passage for the boats. The mats and hurdles intercept the spawn, which is skimmed off the water, preserved for sale in large jars, and is bought by persons who have ponds or other pieces of water which they may wish to stock with gold or other fish. Another plan is to hatch fish-eggs in paddy fields, and in these places the spawn speedily comes to life, and the flocks of little fishes are herded from one field to another as the food becomes exhausted. The trade in ova is so well managed, even in the present day, that fish are plentiful and cheap-so cheap as to form a large portion of the food of the people ; and nothing so much surprises the Chinese who come here as the high price paid for the fish of this country. A Chinese fisherman was much astonished, some years ago, at the price he was charged for a fish-breakfast at Toulon. This person had arrived in France with four or five thousand young fish of the best kinds produced in his country, for the purpose of their being placed in the great marine aquarium in the Bois de Boulogne. Being annoyed at the comparative scarcity of fish in France, the young Chinaman wrote a brief memoir, showing that, with the command of a small pond, any quantity of fish might be raised at a trifling expense. All that is necessary, he stated in the memoir alluded to, is to watch the period of spawning, and throw yolks of eggs into the water from time to time, by which means an incredible quantity of young fry are saved from destruction. For, according to the information conveyed by this very intelligent youth, thousands of infantile fish annually die from starvation -they are unable to seek their own food at so tender an age. Many of the stories we hear about the Chinese mode of breeding fish are evidently exaggerated ; but one particularly ingenious method of artificial hatching which has been resorted to by the people of China is worth noting as a piscicultural novelty. These ingenious Celestials carry on a business in selling and hatching fish-spawn, collecting the impregnated eggs from various rivers and lakes, in order to sell to the proprietors of canals and private ponds. When the proper season for hatching arrives, they empty a hen's egg, by means of a small aperture, sucking out the natural contents, and then, after substituting fish-spawn, close up the opening. The egg thus manipulated is placed for a few days under a hen ! By and by the shell is broken, and the contents are placed in a vessel of water, warmed by the heat of the sun only ; the eggs speedily burst, and in a short time the young fish are able to be transported to a lake or river of ordinary temperature, where they are of course left to grow to maturity without being further noticed than to have a little food thrown to them. The luxurious Romans achieved great wonders in the art of fish-breeding, and were able to perform curious experiments with the piscine inhabitants of their aquariums ; they were also well versed in the arts of acclimatisation. A classic friend, who is well versed in ancient fish lore, tells me that the great Roman epicures could run their fish from ice-cold water into boiling cauldrons without handling them ! They spared neither labour nor money in order to gratify their palates. The Italians sent to the shores of Britain for their oysters, and then flavoured them in large quantities on artificial beds. The value of a Roman gentleman's fish in the palmy days of Italian banqueting was represented by an enormous sum of money. The stock kept up by Lucullus was never valued at a less sum than Y-35,000! These classic lovers of good things had pet breeds of fish in the same sense as gentlemen in the present day have pet breeds of sheep or horned cattle. Lucullus, for instance, to have such valuable stock, must have been in possession of unique varieties derived from curious crosses, etc. Red mullet or fat carp, which sold for large prices, were not at all unusual. Sixty pounds were given for a single mullet, more than three times that sum being paid for a dish of that fish ; and enormous sums of money were lavished in the buying, rearing, and taming of the mullet ; so much so, that some of those who devoted their time and money to this purpose were satirised as mullet millionaires. One noble Roman went to a fabulous expense in boring a tunnel through a mountain, in order to obtain a plentiful supply of saltwater for his fish-ponds. Sergius Orata invented artificial oyster-beds. He caused to be constructed at Bake, on the Lucrine Sea, great reservoirs, where he grew the dainty mollusc in thousands; and in order that he and his friends might have this renowned shell-fish in its very highest perfection, he built a palace on the coast, in order to be near his oyster-ponds ; and thither he resorted when he wanted to have a fish-dinner free from the care and turmoil of business. Many of the more luxurious Italians, imitating Sergius Orata, expended fabulous sums of money on their fish-ponds, and were so enabled, by means of their extravagance, to achieve all kinds of outré results in the fattening and flavouring of their fish. A curious story, illustrative of these times and of the value set on fish of a particular flavour, is related, in regard to the bass (labrax Lupus) which were caught in the river Tiber. The Roman epicures were very fond of this fish, especially of those caught in a particular portion of the river, which they could distinguish by means of their taste and fine colour. An exquisite, while dining, was horrified at being served with bass of the wrong flavour, and loudly complained of the badness of the fish ; the fact being that the real bass (the high-coloured kind) were flavoured by the disgusting food which they obtained at the mouth of a common sewer. The modern phase of pisciculture is entirely a commercial one, which as yet does not lie in imparting fanciful flavours to fish, but has developed itself both at home and abroad in the replenishing of exhausted streams with salmon, trout, or other kinds of fish. The present idea of pisciculture, as a branch of commerce, is due to the shrewdness of a simple French peasant, who gained his livelihood as a pecheur in the tributaries of the Moselle, and the other streams of his native district, La Bresse in the Vosges. He was a thinking man, although a poor one, and it had long puzzled him to understand how animals yielding such an abundant supply of eggs should, by any amount of fishing, ever become scarce. He knew very well that all female fish were provided with tens of thousands of eggs, and he could not well see how, in the face of this fact, the rivers of La Bresse should be so scantily peopled with the finny tribes. Nor was the scarcity of fish confined to his own district : the rivers of France generally had become impoverished ; and as in all Catholic countries fish is a prime necessary of life, the want of course was greatly felt. Joseph Remy was the man who first found out what was wrong with the French streams, and especially with the fish supplies of his native rivers-and, better than that, he discovered a remedy. He ascertained that the scarcity -of fish was chiefly caused by the immense number of eggs that never came to life, the enormous quantity of young fish that were destroyed by enemies of one kind or another, and the fishing-up of all that was left, in many instances, before they had an opportunity to reproduce themselves; at any rate, without any care being taken to leave a sufficient breeding stock in the rivers, so that the result he discovered had become inevitable. The guiding fact of pisciculture has been more than once accidentally re-discovered-that is, allowing that the ancient Romans knew it exactly as now practised; but nothing came of such discoveries, and till a discovery be turned to some practical use, it is, in a sense, no discovery at all. After being lost for many hundred years, the art of artificially spawning fish was re-discovered in Germany by one Jacobi, and practised on some trout more than a century ago. This gentleman not only practised pisciculture himself, but wrote essays on the subject as well. His elaborate treatise on the art of fish-culture was written in the German language, but also translated into Latin, and inserted by Duhamel du Monceau in his General Treatise on Fishes. Jacobi, who practised the art for thirty years, was not satisfied with a mere discovery, but at once turned what he had discovered to practical account, and, in the time of Jacobi, great attention was devoted to pisciculture by various gentlemen of scientific eminence. Count Goldstein, a savan of the period, likewise wrote on the subject. The Journal of Hanover also had papers on this art, and an account of Jacobi's proceedings was enrolled in the Memoirs of the Royal Academy of Berlin. This discovery of Jacobi was the simple result of keen observation of the natural action of the breeding salmon. Observing that the process of impregnation was entirely an external act, he saw at once that this could be easily imitated by careful manipulation ; so that, by conducting artificial hatching on a large scale, a constant and unfailing supply of fish might readily be obtained. The results arrived at by Jacobi were of vast importance, and obtained not only the recognition of his government, but also the more solid reward of a pension. 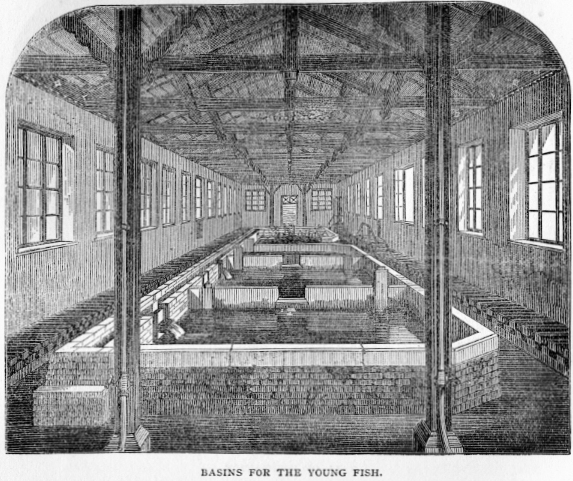 Some persons dispute the claims of France to the honour of this discovery, asserting that the peasant Remy had borrowed his idea from the experiments of the late Mr. Shaw of Drumlanrig, who had by the artificial system undertaken to prove that parrs were the young of the salmon. Mr. Shaw's experiments were very complete and laborious; they extended over a number of years, were reported to the Royal Society of Scotland, and were brought to a successful conclusion long before the re-discovery of the art of pisciculture by Remy. In my opinion the honours may be thus divided, whether Remy knew of Shaw's experiments or not: I would give to Scotland the honour of having re-discovered pisciculture as an adjunct of science, and to France the useful part of having turned the art to commercial account. In regard to what has been already stated here as to the accidental discovery of artificial fish-breeding, I may mention that James Hogg, the Ettrick Shepherd, was one of the discoverers. Hogg had an observant eye for rural scenes and incidents, and anxiously studied and experimented on fish-life. He took an active share in the parr controversy. 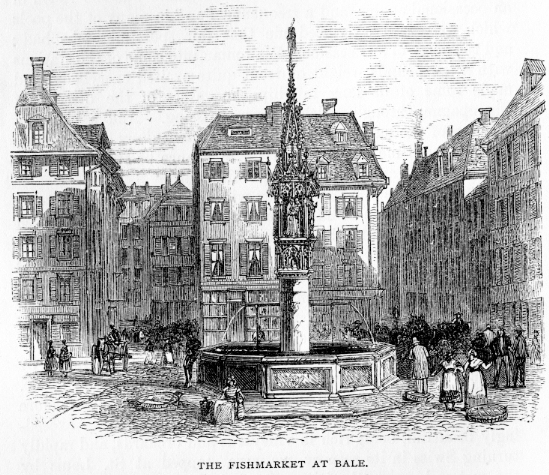 Having seen with his own eyes the branded parr assuming the scales of the smolt, he never doubted after that the fact that the parr was the young of the salmon. In Norway, too, an accidental discovery of this fish-breeding power was made ; and certainly if salmon-fishing in that country goes on at its present rate cultivation will be largely required. The artificial plan of breeding oysters has been more than once accidentally discovered. There is at least one well-authenticated instance of this, which occurred about a century ago, when a saltmaker of Marennes, who added to his income by fattening oysters, lost a batch of six thousand in consequence of an intense frost, the shells not being sufficiently covered with water ; but while engaged in mourning over his loss and kicking about the dead molluscs, he found them, greatly to his surprise, covered with young oysters already pretty well developed, and these, fortunately, although tender, all in good health, so that ultimately he repeopled his salt-bed without either trouble or expense-having of course to wait a year or two for the growth of the natives before he could recommence his commerce. To return to Remy, however, his experiments were so instantaneously crowned with success as even to be a surprise to himself; and in order to encourage him and Gehin, a coadjutor he had chosen, the Emulation Society of the Vosges voted them a considerable sum of money and a handsome bronze medal. But it was not till 1849 that the proceedings of the two attracted that degree of notice which their importance demanded both in a scientific and economic sense. Dr. Haxo of Epinal then communicated to the Academy of Sciences at Paris an elaborate paper on the subject, which at once fixed attention on the labours of the two fishermen-in fact, it excited a sensation both in the Academy and among the people. The government of the time at once gave attention to the matter, and finding, upon inquiry, everything that was said about the utility of the plan to be true, resolved to have it extended to all the rivers in France, especially to those of the poorer districts of the country. The artificial system of fish-breeding was by this mode of action rapidly extended over the chief rivers of France, and added much to the comfort of the people, and in some cases little fortunes were realised by intelligent farmers who appreciated the system, and had a pond or stream on which they could conduct their experiments in safety. 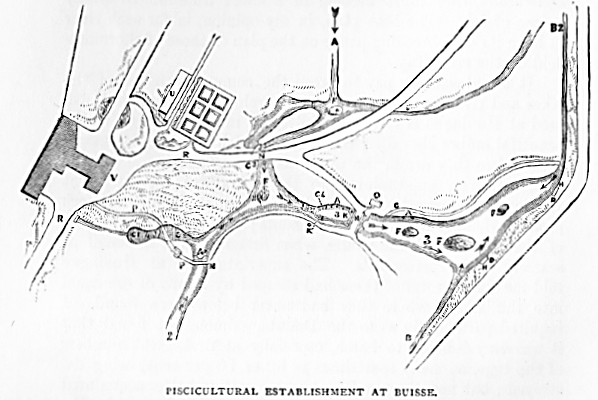 The piscicultural system culminated in France, chiefly under the direction of Professor Coste, in the erection of a great establishment at Huningue, near Bale, for the collection and distribution of fish-eggs. In order to see this place with my own eyes, and so be enabled to describe exactly how the piscicultural business of France is administered, I paid a visit to the great laboratory. Bent on a piscatorial tour, I noted with care the spots of water that pretty often fringed the line of rails, and wondered if they were populated by any of the finny tribe ; if so, by what kind of fish, and whether they had been replenished by the aid of pisciculture ? There was evidently fishing in the districts passed through, because at some of the stations there was the vision of an occasional angler, and a frequent " flop " in many of the pools which we passed convinced me that fair sport might be had ; and the entry of an occasional Waltonian into some of the stations with a few pounds weight of trout quite excited everybody, and made some of us long to whip the waters of the district of Champagne, through which we were passing. And a close inspection of the national etablissement de pisciculture at Huningue has convinced me that if any river in France be still fishless, it is not through any fault of the government. As even the longest journey will come to an end, the train arrived in due time at Mulhouse, or Mulhausen, as it is called in the German, and it being late and dark, and all of us (I was one of a little party) somewhat fatigued, we allowed ourselves to be carried to the nearest hotel, a large, uncomfortable, dirtylooking place, where apparently they seldom see British gold, and make an immense charge for bougies. Being within scent of Switzerland, having the feeling that we were in the shadow of its mountains, and almost within hearing of the noise made by its many waters, we hurried on by the first morning train to Bale. The distance is short, and the conveyance quick. Almost before we had time to view the passing landscape, which is exceedingly beautiful, being rich in vineyards and orchards, and rapidly turning Swiss in its scenery, we were stopped at St. Louis by the custom-house authorities, who, it is but proper to say, are exceedingly polite to all honest travellers. I would advise any one in search of the etablissement de pisciculture at Huningue to leave the train at this station. Not knowing its proximity at the time of my visit, I went right on to Bale. glow about the "beautiful Rhine," as, of course, a young lady ought to be, suggested that the pronunciation might be " Hiningue," which proved a shrewd guess, as immediately on hearing it we were addressed in tolerable but very broken English by a quiet-looking coachman, who said, " Come with me ; I have study the English grammaire ; I know where you want to go, and will take you." 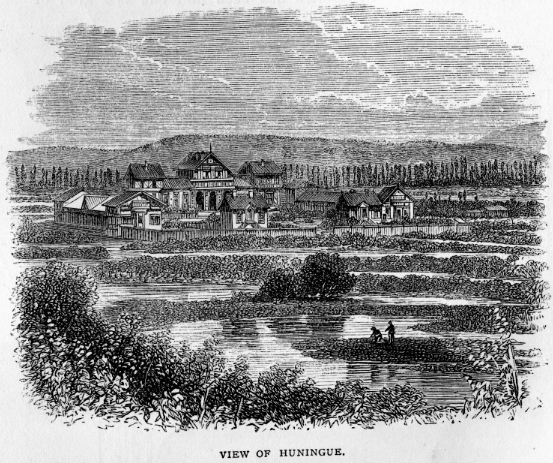 Although I could not help wondering that a celebrated place, as we all thought Huningue ought to be, was not better known, I felt pretty sure our coachman knew it ; and having persuaded my Scotch friend and his young lady to take a drive, we at once started for the etablissement de pisciculture, where we were all of us most hospitably received by the superintendent, who at once conducted us over the whole place with great civility and attention. employed in the appareils and basins. The waters of the Augraben stream, which cross the grounds, are of very little use. Nearly dry in summer, rapid and muddy after rain, they have only hitherto served to supply some small exterior basins. Of course, different qualities of water are quite necessary for the success of the experiments in acclimatisation carried on so zealously at this establishment. Some fish delight in a clear running stream, while others prefer to pass their life in sluggish and fat waters. The engineering of the different water-supplies, all of them at different levels, has been effectually accomplished by M. Coumes, the engineer of this department of the Rhine, who, in conjunction with Professor Coste, planned the buildings at Huningue; indeed the machinery of all kinds is as nearly as possible perfect. numerous than can be supplied; and before second applications from the same people can be entertained, it is necessary for them to give a detailed account of how their former efforts succeeded. The eggs, when sent away, are nicely packed in boxes among wet moss, and they suffer very little injury if there be no delay in the transit.
" How about the streams from which the eggs are brought?" I asked. "Does this robbery of the spawn not injure them ?" " Oh, no ; we find that it makes no difference whatever. The fish are so enormously fecund that the eggs can be got in any quantity, and no difference be felt in the parent waters ; what we obtain here are a mere percentage of the grand totals deposited by the fish." Of course, as the operations are pursued over a large district of two countries, no immediate difference will be felt ; but how if these Huningue explorateurs go on for years taking away tens of thouands of eggs ? Will not that ultimately prove a case of robbing Peter to pay Paul ? I know full well that all kinds of fish are enormously prolific, and the reader would see from the figures given in a former section that it is so ; but suppose a river, with the breeding power of the Tay, was annually robbed of a few million eggs, the result must some day be a slight difference in the productive power of the water. I would like to know with exactitude if, while the waters of France are being replenished, the rivers in Switzerland and Germany are not beginning to be in their turn impoverished ? It surely stands to reason that if the impoverishment of streams resulting from natural causes be aided by the carrying away of the eggs by zealous explorateurs, they must become in a short time almost totally barren of fish. The best plan, in my opinion, is for each river to have its own breeding-ponds on the plan of those of Stormontfield on the river Tay. It would scarcely pay to breed the commoner fishes of the lakes and rivers, as pike, carp, and perch ; the commonest fish bred at Huningue is the fera, whilst the most expensive is the beautiful ombre chevalier, the eggs of which cost about a penny each before they are in the water as fish. The general calculation, however, appertaining to the operations carried on at Huningue gives twelve living fish for a penny. The fera is very prolific, yielding its eggs in thousands ; it is called the herring of the lakes ; and the young, when first born, are so small as scarcely to be perceptible. The superintendent at Huningue told me that several of them had escaped by means of the canal into the Rhine, where they had never before been found. I inquired particularly as to the Danube salmon, but found that it was very difficult to hatch, especially at first, great numbers of the eggs, as many sometimes as 60 or 70 per cent, being destroyed ; but now the manipulators are getting better acquainted with the modus operandi, and it is expected that by and by the assistants at Huningue will be as successful with this fish as they are with all others. Even allowing for a very considerable loss in the artificially-manipulated ova-and it is thought that two-thirds at least of the eggs of this fish are in some way lost -it is certain that the artificial system of protection is immensely more productive in fish than the natural one, for it has been said, in reference especially to the salmon of the river Tay, that hardly one in a thousand of the eggs ever reaches maturity as a proper table-fish, such is the enormous destruction of eggs and young fry ; and the percentage of destruction in Catholic countries is greatly larger, because during those fast-days enjoined by the church fish must be obtained. by a peninsula, and the division is completed by a grating which prevents the mixing of the fish contained in each part, and also arrests the ascent or descent of the fry. The sheet of water is supplied from sources of an elevated temperature which diverge into the stream, and thence into pond No. 2 at N. This basin (2) is 150 metres long, with a mean breadth of 8 metres, and a depth varying from 1 to 2 metres. Besides the waters from the first pond, this basin is supplied from the springs, and from the millstream which rises from a rock situated at a distance of 200 metres. This pond contains fish of the second year. A sluice or water-gate (J), placed in the deepest part of the pond, affords the means of turning the water and the fish contained therein into the pond No. 3. Courses of rough stones and weeds line the banks of the pond, and form places of shelter -for the fish, besides encouraging the growth of such shell-fish as shrimps, lobsters, etc. The third pond (3) has a surface of about 5000 yards, with a depth equal to that of the second pond. An underground canal (G) runs along the eastern side, and at distances of 2 metres trenches lined with stones loosely thrown together join the canal to the basin, and allow the fish to circulate through these subterranean passages, where every stone becomes a means of shelter and concealment. The adult trout can conceal themselves in the submerged holes and crevices of the islands (F), of which there are three in the pond. The narrowest part of the basin is crossed by a viaduct of 8 metres (N), to the arch of which is fitted an iron grating with rods in grooves to receive either a sluice or a snare. The sluice, formed of fine wire, keeps out the fish that would destroy the spawn at the time of fecundation. The spawn is covered with a layer of fine round gravel, to the thickness of 0 m. 30, which the trout can easily raise as fast as it bursts the egg. The snare or netting encloses the fish destined for artificial breeding without hurting them, and also secures the fish that are to be consumed, and those which it is necessary to destroy because of their voracity, as the pike. A floodgate placed at the lower end of the pond permits the pond to be emptied when necessary, and an iron grating prevents the escape of the fish. All the ponds are protected by a double line of galvanised iron wire placed on posts armed with hooks, and yet low enough to allow a boat to pass. The water of the ponds finally passes into the Isere, where a permanent snare allows strange fish to penetrate into the ponds. At spawning time a great many trout deposit their spawn there. The small pond (4) fed by the mill-stream is a sort of reservoir for large fish destined for sale or domestic use. Throughout the year the fish caught in the nets of the third pond are placed in this basin, so when the spawning season arrives it is a vast nursery for the purpose of reproduction. In the house (O) built near the bridge (N) of the third pond lodge the guard and the hatching-apparatus. The appareils are similar to those employed at the College de France, and are supplied from a spring. One particular appareil, placed in a source of which the temperature never varies, is slightly different from the other models : it is simply zinc boxes pierced with very fine holes. This apparatus, which has been in use for three years, has given great satisfaction. It may be added that the establishment at Buisse can supply 40,000 or 50,000 young trout in the year at five centimes each, a result which is mainly due to the care and solicitude with which M. de Galbert has conducted his operations. What strikes us most in connection with the history of French fish-culture is the essentially practical nature of all the experiments which have been entered upon. There has been no toying in France with this revived art of fish-breeding. The moment it was ascertained that Remy's discoveries in artificial spawning were capable of being carried out on the largest possible scale, that scale was at once resolved upon, and the government of the country became responsible for its success, which was immediate and substantial. The discoverer of the art was handsomely rewarded ; and the great building at Huningue, used as a place for the reception and distribution of fish-eggs, testifies to the anxiety of France to make pisciculture one of the most practical industries of the present day. Unceasing efforts are still being made by the government to extend the art, so that every acre of water in that country may be as industriously turned to profit as the acres of land are. Why should not an acre of water become as productive as an acre of land? We have an immensity of water space that is comparatively useless. The French people are now beginning thoroughly to appreciate the value of their lakes and rivers, and to cultivate them with the greatest possible assiduity-there is not an acre of water in the country that is not turned to use by the people. Think of the fish-ponds of Doombes being of the extent of thirty thousand acres ! No wonder that in France pisciculture has become a government question, and been taken under the protecting wing of the state. The different kinds of water in France are carefully considered, and only fish suitable for them placed therein. In marshy places eels alone are deposited, whilst in bright and rapid waters trout and other suitable fish are now to be found in great plenty. Attention is at present being turned to seafish, and the latest " idea " that has been promulgated in connection with the cultivation of sea-animals is turtle-culture. The artificial multiplication of turtle, on the plan of securing the eggs and protecting the young till they are able to be left to their own guidance, is advocated by M. Salles, who is connected with the French navy, and who seems to have a considerable knowledge of the nature and habits of the turtle. To some extent turtle-culture is already carried on in the island of Ascension - so far at least as the protection of the eggs and watching over the young is concerned. M. Salles proposes, however, to do more than is yet done at Ascension ; he thinks that, to arrive quickly at a useful result, it would be best to obtain a certain number of these animals from places where they are still abundant, and transport them to such parks or receptacles as might be established on the coasts of France and Corsica, where, at one time, turtles were plentiful. Animals about to lay would be the best to secure for the proposed experiments ; and these might be captured when seeking the sandy shores for the purpose of depositing their eggs. Male turtles might at the same time be taken about the islets which they frequent. A vessel of sufficient dimensions should be in readiness to bring away the precious freight ; and the captured animals, on arriving at their destination, should be deposited in a park chosen under the following considerations :-The formation of the sides to be an inclosure by means of an artificial barrier of moderate height, formed of stones, and perpendicular within, so as to prevent the escape of the animals, but so constructed as to admit the sea, and, at the same time, allow of a large sandy background for the deposition of the eggs, which are about the size of those laid by geese. As the turtles are herbivorous, the bottom of the park should be covered with sea-weeds and marine plants of all kinds, similar to those the animal is accustomed to at home. A fine southern exposure ought to be chosen for the site of the park, in order to obtain as much of the sunshine as possible, heat being the one grand element in the hatching of the eggs. Turtles are very fond of sunshine, and float lazily about in the tropical water, seldom coming to the shore except to lay. This they do in the night-time : crawling cautiously ashore, and scraping a large hole in a part of the sand which is never reached by the tide, they deposit their eggs, and carefully cover them with the sand, leaving the sun to effect the work of quickening them into life. It may be as well to state here that the French people eat all kinds of fish, whether they' be from the sea, the river, the lake, or the canal. In Scotland and Ireland the salmon only is bred artificially as yet, and chiefly because it is a valuable and money-yielding animal, and no other fresh-water fish is regarded in these countries as being of value except for sport. In France large quantities of eels are bred and eaten ; but in Scotland, and in some parts of England, the people have such a horror of that fish that they will not touch it. This of course is due to prejudice, the eel being good for food in a very high degree. In all Roman Catholic countries there are so many fast-days that fishfood becomes to the people an essential article of diet ; in France this is so, and the consequence is that a good many private amateurs in pisciculture are to be found in that country ; but the mission of the French government in connection with fishculture is apparently to meddle only with the rearing and acclimatising of the more valuable fishes. It would be a waste of energy for the authorities at Huningue to commence the culture of the carp or perch. In our Protestant country there is no demand for the commoner river or lake fishes except for the purposes of sport ; and with one or two exceptions, such as the Lochleven trout, the charr, etc., there is no commerce carried on in these fishes. One has but to visit the fishmarket at Paris to observe that all kinds of fresh-water fish and river crustacea are there ranked as saleable, and largely purchased. The mode of keeping these animals fresh is worthy of being followed here. They are kept alive till wanted in large basins and troughs, where they may at all times be seen swimming about in a very lively state. As soon as the piscicultural system became known, it was rapidly extended over the whole continent of Europe, and the rivers of Germany were among the first to participate in the advantages of artificial cultivation. In particular may be noticed the efforts made to increase the supplies of the Danube salmon, a beautiful and excellent food-fish, with a body similar to the trout, but still more shapely and graceful, and which, if allowed time, is said to grow to an enormous size. The young salmon of the Danube are always of a darker colour than those a little older, but they become lighter in colour as they progress in years. The mouth of this fish is furnished with very strong teeth ; its back is of a reddish grey, its sides and belly perfectly white ; the fins are bluish white; the back and the upper part of both sides are slightly and irregularly speckled with black and roundish red spots. This fish is also very prolific. Professor Wimmer of Landshut, the authorities at Huningue mentioned, had frequently obtained as many as 40,000 eggs from a female specimen which weighed only eighteen pounds. Our own Salmo salar is not so fecund, it being well understood that a thousand eggs per pound weight is about the average spawning power of the British salmon. The ova of the Danube salmon are hatched in half the time that our salmon eggs require for incubation - viz. in fifty-six days-while the young fry attain the weight of one pound in the first year; and by the third year, if well supplied with the requisite quantity of food, they will have attained a weight of four pounds. The divisions of growth of the great fish of the Danube, as compared with Salmo salar, are pretty nearly as follows:-Our fish, curiously enough, may at the end of two years be eight pounds in weight, or it may not be half that number of ounces. One batch of a salmon hatching go to the sea at the end of the first year after birth, and rapidly return as grilse, handsome four-pound fish, whilst the other moiety remain in the fresh water till the expiry of the second year from the time of birth, so that they require about thirty months to become four-pound fish, by which time the first moiety are salmon of eight or ten pounds ! These are ascertained facts. This is rapid growth when compared with the Danube fish, which, after the first year, grows only at about the rate of eighteen ounces per annum. But, even at that rate, fish-cultivation must pay well. Suppose, for the sake of an illustration, that by the protected or piscicultural system a full third (i.e. 13,500) of the 40,000 eggs arrive in twelve months at the stage of pound fish, and are sold at the rate of threepence per pound weight, a revenue of £163 would thus result in one year's time from a single pair of breeding salmon ! Two pairs would, of course, double the amount, and so on. were begun only one pond was to be found at Stormontfield, but another pond for the smolts has since been added in order to complete the suite. A sluice made of fine wire-grating admits of the superfluous water being run off into the Tay, so that an equable supply is invariably kept up. It also serves for an outlet to the fish when it is deemed expedient to send them out to try their fortune in the greater deep near at hand, and for which their pond experience has been a mode of preparation. 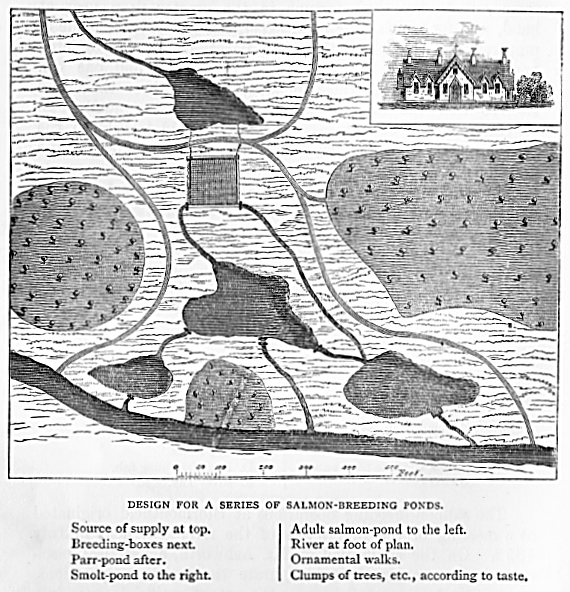 The planning of the boxes, ponds, sluices, etc., has been accomplished with great ingenuity; and one can only regret that the whole apparatus is not three times the size, so that the Tay proprietors might breed annually two or three million of salmon, which would add largely to the productiveness of that river, and of course aid in increasing the rental. For the purpose of showing the level of the pond at Stormontfield I beg to introduce what the French people call "a profile." The salmon-breeding operations at Stormontfield originated at a meeting of the proprietors of the river Tay held in July 1852. On the suggestion of Mr. Ashworth, a practical pisciculturist was engaged to inaugurate the breeding operations, and to teach a local fisherman the art of artificial spawning. The preparation of the spawn for the nursing boxes was commenced on the 23d of November 1853, and in the course of a month 300,000 ova were deposited in the 300 boxes, which had been carefully filled with prepared gravel, and made all ready for their reception. Mr. Ramsbottom, who conducted the manipulation, says the river Tay is one of the finest breeding streams in the world, and thinks that it would be presumptuous to limit the numbers of salmon that might be bred in it were the river cultivated to the full extent of its capabilities. four months after the stocking of the boxes; and during April and May most of the eggs had burst into life, and the fry were observed waddling about the breeding-boxes, and were in June promoted to a place in the reception-pond, being then tiny fish a little more than an inch long. 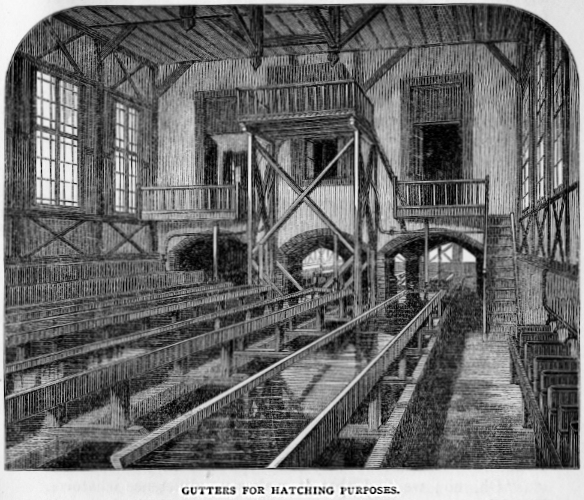 The first year’s experiments were remarkably successful in showing the practica bility of hatching, rearing, and maintaining in health, a very large number of young fish, at a comparatively trifling cost. The artificial breeding of salmon is still carried on at these ponds, and with very great success, when their limited extent is taken into account: half-a-million of eggs are hatched every year. They have sensibly increased the stock of fish in the Tay, and also, as I will by and by relate, under the separate head of "The Salmon," contributed greatly to the solution of the various mysteries connected with the growth of that fish. The fish, it is remarkable, suffer no deterioration of any kind by being bred in the ponds, and can compare in every respect with those bred in the river. 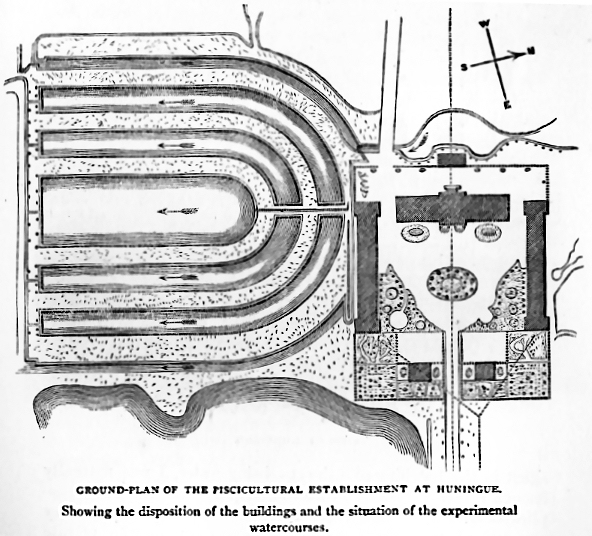 The plan of the ponds at Stormontfield, as originally constructed, will be a better guide to persons desiring information than any written description. The engraving on the opposite page with the double pond, shows a design of my own, founded on the Stormontfield suite; it contains a separate pond for the detention, for a time, of such large fish as may be taken with their spawn not fully matured. Cottages for the superintendent of the ponds and his assistants are also shown in the plan. The ponds at Stormontfield were originally designed with a view to breed 300,000 fish per annum, but after a trial of two years it was found, from a specialty in the natural history of the salmon elsewhere alluded to, that only half that number of fish could be bred in each year. Hence the necessity for the smolt-pond which was added a few years ago, and which will now admit of a hatching at Stormontfield of at least 500,000 eggs every year. Another reason for the construction of the additional pond was the fact of the old one being too small in proportion to the breeding-boxes. Its dimensions were 223 feet by 112 feet at its longest and broadest parts. The second pond is nearly an acre in extent, and well adapted for the reception of the young fish. The egg-boxes at Stormontfield, unlike those at Huningue, are in the open air, and in consequence the eggs are exposed to the natural temperature, and take, on an average of the seasons, about 120 days to ripen into fish. For instance, the eggs laid down in November 1872 did not come to life till 29th March 1873. The young fish, as soon as they are able to eat—which is not for a good few days, the umbilical bag supplying all the food required for a time by the newly-hatched animal—are fed with particles of boiled liver. On the occasion of my last visit Mr. Peter Narshall, the very intelligent keeper, threw a few crumbs into each of the ponds, which caused an immediate rising of the fry in great numbers. It would, of course, have been a simple plan to turn each year's fish out of the ponds into the river as they were hatched, but it was thought advisable rather to detain them till they were seized with the migratory instinct and assumed the scales of smolthood, which occurs, as already stated in other parts of this work, at the age of one and two years respectively. Indeed, the experiments conducted at the Stormontfield ponds have conclusively settled the long-fought battle of the parr, and proved indisputably that the parr is the young of the salmon, that it becomes transformed to a smolt, grows into a grilse, and ultimately attains the honour of full-grown salmonhood. The anomaly in the growth of the parr was also attempted to be solved at Stormontfield, but without success. In November and December 1857 provision was made for hatching in separate compartments the artificially impregnated ova of - 1, parr and salmon; 2, grilse and salmon; 3, grilse pure; 4, salmon pure. It was found, when the young of these different matches came to be examined early in April 1859, that the sizes of each kind varied a little, the superintendent of fisheries informing us that -"1st, the produce of the salmon with salmon are 4 in, in length ; 2d, grilse with salmon, 3½ in. ; 3d, grilse with grilse, 3½ in. ; 4th, parr with grilse, 3 in. ; 5th, smolt from large pond, 5 in." These results of a varied manipulation never got a fair chance of being of use as a proof in the disputation ; for, owing to the limited extent of the ponds at the time, the experiments were matured in such small boxes or pools as evidently tended to stunt the growth of the fish. Up to the present time the riddle which has so long puzzled our naturalists in connection with the growth of the salmon has not been solved. A visitor whom I met at the ponds was of opinion that a sufficient quantity of milt was not used in the fructification of the eggs, as the male fish were scarcer than the female ones, and that those eggs which first came into contact with the milt produced the stronger fish. The late Mr. Robert Buist used to say that what most struck strangers who visited the ponds was the great disparity in the size of fish of the same age, the difference of which was only that of a few weeks, as all were hatched by the month of May. That there are strong and weak fry from the moment that they burst the covering admit of no doubt, and that the early fish may very speedily be singled out from among the late ones is also quite certain. In the course of a few weeks the smolts that are to leave at the end of the first year can be noted. The keeper's opinion is that at feeding time the weak are kept back by the strong, and therefore are not likely to thrive %o fast as those that obtain a larger portion of food ; he lays great stress on feeding, and his opinion on that subject is entitled to consideration. 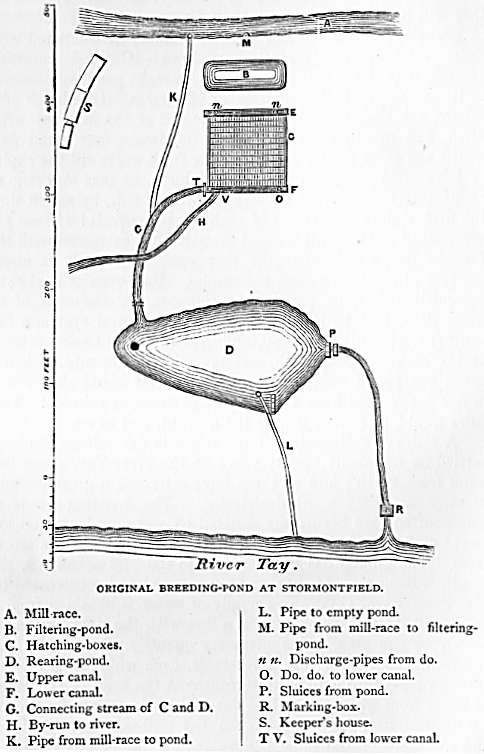 The guiding of the smolts from the ponds to the river used to be easily managed through the provision made at Stormontfield for that purpose, and which consisted of a runlet lined with wood, protected at the pond by a perforated zinc sluice, and terminating near the river in a kind of reception-chamber, about four feet square, likewise provided with a zinc sluice (also perforated), to keep the fish from getting away till the arranged time, thus affording proper facilities for the marking and examination of departing broods. [See plan.] The sluice being lifted, the current of water carried the fish down a gentle slope to the Tay, into which they proceeded in considerable quantities, day by day, till all had departed ; the parrs, strange to say, evincing no desire to remove, although, of course, being in the same breeding-ponds, they had a good opportunity of reaching the river. Now all the outlets are kept constantly open, so that the fish can go away to the sea when the instinct seizes them. It was a great drawback in former years at Stormontfield, during the hatching seasons, that many fish were caught with their eggs not sufficiently matured, and could not be used in consequence. To remedy this, a plan has been adopted of keeping all the salmon that are caught, if they be so nearly ripe for spawning as to warrant their detention. These are confined in the mill-race till they become thoroughly ready for the manipulator, and are kept within bounds by strong iron gratings, placed about 100 yards from each other. These gravid fish are taken out as they are required, or rather as they ripen, by means of a small sweep-net, and it is noteworthy that the animals, after being once or twice fished for, become very cunning, and hide themselves in such bottom holes as they can discover, in order that the net may pass over them. I have no doubt that the Stormontfield mill-race forms an excellent temporary feeding-place for these fish, as its banks are well overhung with vegetation, and its waters are clear as crystal, and of good flavour. It is a decided convenience to be able thus to store the egg-and-milt producing fish till they are wanted, and will render the annual filling of the breeding-boxes a certainty, which, even under the old two-year system, was not so, in consequence of floods on the river Tay, and from many other causes besides. Upwards of three millions of pond-bred fish have now been thrown into the river Tay, and the result has been a satisfactory rise in the salmon-rental of that magnificent stream. On the 23d November 1853 the stocking of the boxes commenced, and before a month had expired 300,000 ova were deposited, being at the rate of 1000 to each box, of which at that time there were 300. These ova were hatched in April 1854, and the fry were kept in the ponds till May 1855, when the sluice was opened, and one moiety of the fish departed for the river and the sea. About 1300 of these were marked by cutting off the dead or second dorsal fin. The smolts marked were about one in every hundred, so that about 130,000 must have departed, leaving more than that number in the pond. The second spawning, in 1854, was a failure, only a few thousand fish being produced. This result arose from the imperfect manipulation of the fish by those intrusted with the spawning. The third spawning took place between the 22d November and the 16th December 1855, and during that time 183,000 ova were deposited in the boxes. These ova came to life in April 1856, The second migration of the fry spawned in 1853 took place between the 20th April and 24th May 185 G. Of the smolts that then left the ponds, 300 were marked with rings, and 800 with cuts in the tail. Many grilses having the mark on the tail were re-taken, but none of those marked with the ring. 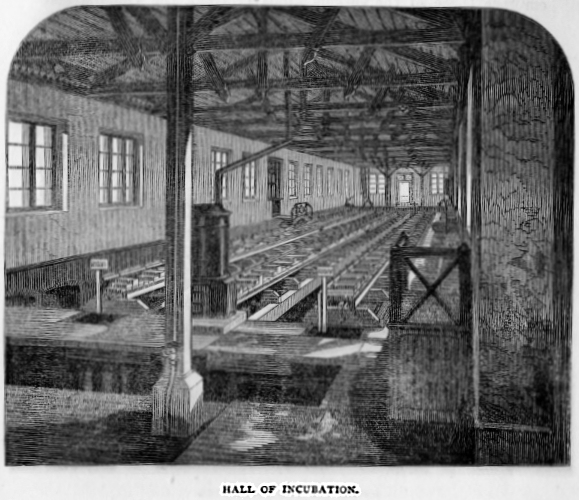 The smolts from the hatching of 1856 left the pond in April 1857. About 270 were marked with silver rings inserted into the fleshy part of the tail ; about 1700 with a small hole in the gill-cover ; and about 600 with the dead fin cut off in addition to the mark in the gill-cover. Several grilses with the mark on the gill and tail were caught and reported, but no fish marked with the ring. The fourth spawning took place between the 12th November and the 2d December 1857, when 150,000 ova were deposited in the boxes. These came to life in March 1858. Of the smolts produced from the previous hatching, which left the pond in 1858, 25 were marked with a silver ring behind the dead fin, and 50 with gilt copper wire. Very few of this exodus were reported as being caught. The smolts produced from the hatching of 1858 left the pond in April 1859, and 506 of them were marked. The fifth spawning, from 15th November to 13th December 1859, produced 250,000 ova, which were hatched in April 1860. Of the smolts that left in 1860, 670 were marked, and a good many of them were reported as having been caught on their return from the sea. The smolts of the hatching of 1860 left the pond in May 1861, but none of them were marked. The number of eggs deposited in the breeding-boxes in the spawning season of 1862 (November and December) was about 250,000 ; but in 1863 not more than 80,000 ova could be obtained in consequence of the unfavourable state of the river for capturing gravid salmon. During the last nine years the hatching has been continued as usual, about half-a-million eggs being now manipulated every season ; but, considering the size of the river Tay, which has a water basin of 2250 square miles, four times that number of fish might be advantageously thrown into the water. Peter Marshall has proved a most able pisciculturist. The loss of eggs under his management forms an almost infinitesimal proportion of the total quantities hatched at Stormontfield. The pisciculture of salmon and other freshwater fishes is not now a novelty in the United Kingdom ; many experiments in salmon and trout breeding having been instituted, with more or less success, both in Ireland and England. These have been so frequently detailed by the newspapers of the day, as to render it unnecessary to chronicle them here : they are all more or less an imitation of what is done every season at the Stromontfield breeding boxes. 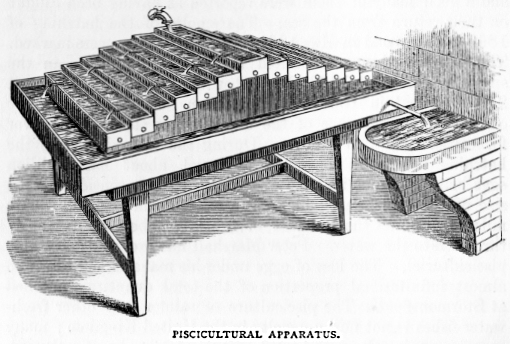 In order that gentlemen who have a bit of running water on their property may try the experiment of artificial breeding, I give a drawing of an apparatus invented by M. Coste suitable for hatching out a few thousand eggs-it could be set up in a garden or be placed in any convenient outhouse. I may state that I am able to hatch salmon-eggs in the saucer of a flowerpot ; it is placed on a shelf over a fixed wash-hand basin, and a small flow of water regulated by a stopcock falls into it. The vessel is filled with small stones and bits of broken china, and answers admirably. Out of a batch of about two hundred eggs brought from Stormontfield, only fifteen were found to have turned opaque in the first five weeks. Eggs hatched in this homely way are very serviceable, as one can examine them day by day, and note how they progress, and in due time observe the development of the fish for a few days. The young animals can only be kept in the saucer about ten or twelve days, and should then be placed in a larger vessel or be thrown into a river. constructed on one or two places of the Severn, or on some of the other suitable salmon streams of England or Wales, capable of turning out two millions of fish per annum, and at a comparatively trifling cost. The formation of the ponds would be the chief expense; a couple of men could watch and feed the fry with the greatest ease. The size adopted might be five times that of the ponds on the river Tay, and the original cost of these was less than £500. I would humbly submit that the ponds should be constructed after the manner of the plan I have elsewhere given. Except by the protecting of the spawn and the young fish from their numerous enemies, there is no way of meeting the present great demand for salmon, which, when in season, is in the aggregate of greater value than the best butcher’s meat, dear as beef and mutton now are. The salmon is an excellent fish to work with in a piscicultural sense, because it is large enough to bear a good deal of handling, and it is very accessible to the operations of mankind, because of the instinct which leads it to spawn in the fresh water instead of the sea. It is only such a fish as this monarch of the brook that would individually pay for artificial breeding, for, having a high money value as an animal, it is clear that salmon-culture would in time become as good a way of making money as cattle-feeding or sheep-rearing. There are waste places in England—the Essex marshes, for instance, or the fens of Norfolk—where it would be profitable to cultivate eels or other fish after the manner of the inhabitants of Comacchio. The English people are fond of eels, and would be able to consume any quantity that might be offered for sale, and the place being in such close proximity to the Thames, other fish might be cultivated as well. All the best portions of the hydraulic apparatus of Comacchio might be imitated, and to suit the locality, such other portions as might be required could be invented. The art of pisciculture is but in its infancy, and we may all live in the hope of seeing great water farms—to be profitable, they must be gigantic—for the cultivation of fish, in the same sense as we have extensive grazing or feeding farms for the breeding and rearing of cattle. In Ireland, the late Mr. Thomas Ashworth, of the Galway fisheries, found it as profitable and as easy to breed salmon as it is to rear sheep. His fisheries became a decided success; and, if we except the cost of some extensive engineering operations in forming fish-passes to admit of a communication with the sea, the cost of his experiments was trifling and the returns exceptionally large. Grave doubts at one time prevailed among persons interested in acclimatisation and pisciculture as to whether or not it would be possible to introduce the British salmon into the waters of Australia; and an interesting controversy was about twelve years ago carried in various journals as to the best way of taking out the fish to that country. Those very wise people who never do anything, but are largely endowed with the gift of prophecy, at once proclaimed that it could not be done; that it was impossible to take the salmon out to Australia, etc. etc. But happily for the cause of progress in natural science, and the success of that particular experiment, there were men who had resolved to carry it out, and who would not be put down. Mr. Francis Francis, Mr. Frank Buckland, and Mr. J. A. Youl, took a leading part in the achievement; but before they fell upon their successful plan of taking out the ova in ice, hot discussions had ensued as to how the salmon could be introduced into the rivers of the Australian continent. Many plans were suggested: some for carrying out the young fish in tanks, and others for taking out the fructified ova, so that the process of hatching might be carried on during the voyage. One ingenious person promulgated a plan of taking the parr in a fresh-water tank a month or two before it changed into a smolt, saying that after the change it would be easy to keep the smolts supplied with fresh salt water direct from the sea as the ship proceeded on her voyage. The mode ultimately adopted was to pack up the ova in a bed of ice, experiments having first been made with a view to test the plan. For that purpose a large number of ova were deposited in an ice-house in order to ascertain how long the ripening of the egg could be deferred—a condition of the experiment of course being that the egg should remain quite healthy. The Wenham Lake Ice Company were so obliging as to allow boxes containing salmon and trout ova, packed in moss, to be placed in their ice-vaults, and to afford every facility for the occasional examination of the eggs. Satisfactory results being obtained—in other words, it having been proved that the eggs of the salmon could with perfect safety be kept in ice for a period exceeding the average time of a voyage to Australia—it was therefore resolved that a quantity of eggs, properly packed in ice, should be sent out. The result of this experiment is now well known, most of the daily papers having chronicled the successful exportation of the ova, and announced that the fish had come to life and were thriving in their foreign home. The naturalisation of fish, to which a brief reference has already been made, is a subject that is not very well understood; but so far as practical experience goes, I have seen nothing to prevent our breeding in England some of the most productive foreign kinds. We must not, however, build ourselves much on the acclimatisation of foreign fish, especially tropical fish, as—although fish can bear great extremes of temperature—it would be no easy matter to habituate them to our climate.